Joann (Bollenbaugh) Culver, age 82 of Boone, passed away on Saturday, December 22, 2018 at her son’s home in Verona, Wisconsin. Following her wishes, Joann has been cremated and a Graveside Service will be held in Oakwood Cemetery in Moingona, Iowa at a later date. Joann Marie (Bollenbaugh) Culver was born in Boone, Iowa on October 29, 1936, the daughter of Leonard Welcome Bollenbaugh and Selma Dorothy (Rose) Bollenbaugh. She graduated from Boone High School in 1954. Joann was united in marriage to Earl Culver on October 17, 1959 at The Little Brown Church in Nashua, Iowa. To this union two children were born, Jeff and Jerry. She lived most of her life in Osceola and Boone. 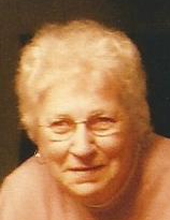 Joann was a dedicated wife, mother, grandmother and helped with farming and was a factory worker at Furnas Controls. She enjoyed socializing with her friends, doing puzzles, playing games, and spending time on Facebook. Most of all, she enjoyed spending time with her children, grandchildren, great-grandchildren, brothers and sisters, and nieces and nephews. Preceded in death by parents; husband, Earl on December 7, 2018; brothers, John and Larry Bollenbaugh, and sisters, Marilyn Anderson and Jeannie Browning. Joann is survived by her two sons, Jeff Culver and his wife, Carla, of Verona, Wisconsin, Jerry Culver and his wife, Connie of McFarland, Wisconsin; four grandchildren, Josh Culver and his wife, Alex of Madison, Wisconsin, Jenny Culver of Dubuque, Iowa, Erin Culver and Annie Culver both of La Crosse, Wisconsin; two great-grandchildren, Jayden and Carter Culver; brothers, Jim and Kenny Bollenbaugh and sister, Mary Bollenbaugh. In memory of Joann, memorials may be directed to the family. To send flowers or a remembrance gift to the family of Joann Culver, please visit our Tribute Store. "Email Address" would like to share the life celebration of Joann Culver. Click on the "link" to go to share a favorite memory or leave a condolence message for the family.